We like when dealers try and take advantage of trends to make the special editions that the automakers were just too wimpy or cheap to attempt. In this case, we've got a Toyota dealer that's taking advantage of Tony Stewart and his racing a Camry in the NASCAR Sprint Cup series. How does it work? 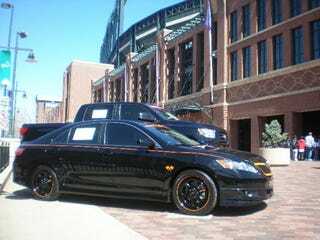 Take a black Toyota Camry, add gaudy orange touches, blacked-out NASCAR wheels, festoon with the #20 and charge an additional $7K. This makes sense to us as most NASCAR fans drive Toyotas, right? One thing you'll notice has not been added to this car is the name "Tony Stewart" as this would almost certainly draw a lawsuit. Anyone have an idea what stadium this is outside of?